I’ve recently tried a new brand of Greek-style yogurt Müller (found in the Northeast and Mid-Atlantic, United States currently). Quaker partnered with Müller to produce these thick, creamy tart yogurt that is sort like Greek yogurt but not exactly. It’s more fun to eat with the assorted toppings to add on your cup of yogurt like their Greek Corner (sugared almonds, chocolate ball candy, and various jellied fruits) and parfait-like yogurt cups called Früt Up that can make your daily snack or light meal a bit healthier and interesting. Müller is a privately held German dairy company that originates from Bavaria, Germany and currently is producing these yogurts until they shift production to upstate New York. Intrigued to try? The folks at Müller are kind to let me select two (2) people to receive ten (10) coupons of free Müller yogurt! All you have to do is comment below as to which Müller yogurt product you’d like to try the most (here’s the link to their website again). Two important things when you enter: (1) You should live within the Northeast, Mid-Atlantic U.S. regions, and Ohio, Michigan and Indiana to acquire these yogurts (you can check if your local market stocks it HERE) and (2) you need a valid e-mail address so I can contact you once this giveaway is over. Deadline is Wednesday, December 5th at 8 PM Eastern Time. Good luck! Many thanks for those who entered (even the ones who emailed me) for the yogurt giveaway! Comments are closed and the winners are Chiaki and John. Congratulations! I love yogurt, specially Greek-style yogurt. So, please let me has a chance to joint The Giveaway from Müller and try out their delicious yogurt! I’ve always loved Greek style yogurt with fruit or honey but never thought to combine it with almonds. 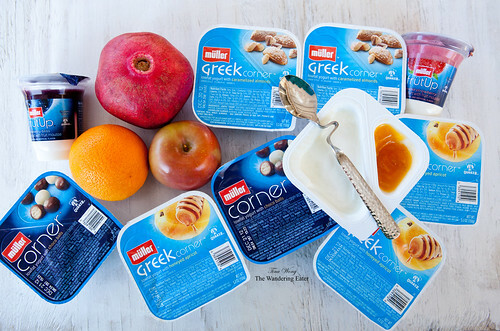 Müller’s yogurt with Caramelized Almonds sounds delicious! I have to go with Muller Greek-Style yogurts! Thank You for a chance at the Giveaway. The Greek Corner lowfat yogurt with carmalized almonds is absolutely amazing!! Cannot wait to try the rest. Thanks for bringing them to a local store near me. Brings back so many memories of Germany!